How do you keep your meal plan on track (if you do) during the holiday rush? Have any great tips? Let us know. Leave a comment. As we enter the holiday season, budgets and waistbands are a little tighter. Between the holiday shopping frenzy and delicious treats in your work break room, healthy meal plans are tossed out the window. For most people, money and time are shifted toward gift purchases and travel. Meals are often overlooked. But there is hope! A little planning sets you up to successfully eat healthy while maintaining your budget and your time through the New Year. 1. Pre-Plan Meals – Meal planning helps reduce waste and cuts down preparation time. 2. Keep an Inventory – Know what’s in the fridge and pantry to avoid duplicate purchases. 3. Make a List (and stick to it!) – Grocery stores are designed to entice you to buy. Using a list helps prevent impulse purchases. 4. Frozen Over Fresh – Have a tendency to let fruits and vegetables spoil? Frozen fruits and veggies are a nutritious alternative and are typically less expensive and less perishable than the fresh equivalents. 5. Shop Sales - Use coupons or your store loyalty card to stock up on frequently used items. Don’t purchase rarely used items just because they are on sale. 6. Avoid Shopping When Hungry – This will lead to impulse buys. Seriously. 7. 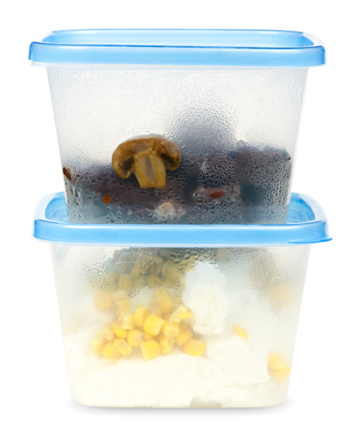 Eat Leftovers – Package “grab and go” servings in reusable containers after a meal instead of sticking the entire dish in the refrigerator. Put a couple of servings in the refrigerator for tomorrow’s lunch. Label all remaining single-servings and pop them into the freezer for another day. Additionally, mix leftovers into a new recipe to save time and money, and add variety to your meals. Google what to do with turkey leftovers. The possibilities are endless. The end of the year can be stressful and lead to meal decisions based on ease and simplicity. Taking a little time to plan can greatly increase your chances of making healthy food decisions no matter what!